Western blot analysis of whole cell lysates probed with CCT beta antibody (VMA00026) followed by detection with HRP conjugated Goat anti Rat IgG (1/10,000, STAR72) and visualized on the ChemiDoc MP with 300 second exposure. Arrow points to CCT beta (molecular weight 57 kDa). CCT beta antibody recognizes T-complex protein 1 subunit beta, also known as TCP-1-beta or CCT-beta. The antibody has been extensively validated for western blotting using whole cell lysates. Rat anti Human CCT beta antibody recognizes human T-complex protein 1 subunit beta, also known as CCT beta, CCT2 or TCP-1-beta. CCT beta is a 535 amino acid cytoplasmically expressed chaperonin molecule involved in protein folding and has been shown to be involved in actin interaction (Llorca et al. 1999). Two isoforms of CCT beta have been described, arising from alternative splicing. It is not clear whether this Rat anti Human CCT beta antibody recognizes the shorter isoform 2, lacking the N-terminal 47 amino acids seen in isoform 1. 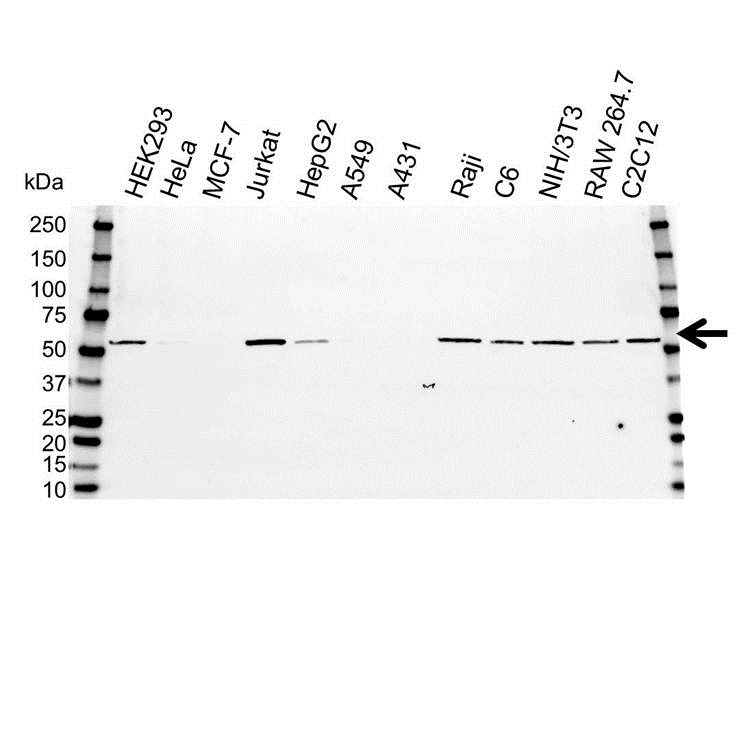 Rat anti Human CCT beta antibody recognizes CCT beta as a single band of ~ 57 kDa in multiple human cell line lysates by western blotting under reducing conditions and is cross reactive with both mouse and rat cell line lysates. Anti CCT beta antibody detects a band of approximately 57 kDa in Jurkat cell lysates.